Reformations Sunday… seems so long ago, so irrelevant, so 15th century; but the reformation was about a dream and the embodiment of a vision, and dreams are still very much alive. “And if America is to be a great nation this must become true. So let freedom ring from the prodigious hilltops of New Hampshire. Let freedom from a sanctuary on Rudy Lane in Louisville, KY! What do you think MLK’s mother had in mind for her son when she blessed him with the name of Christianity’s most illustrious reformer? 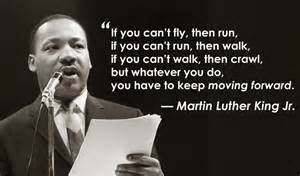 Martin Luther King Jr. grew into his name and became a social reformer, daring to dream of national freedom, emancipation from slavery and inequality. That’s a scary proclamation though; freedom can take us into the unknown… and because of that fear, the track record of societies’ most prolific reformers has proven unfortunately grim. We can lift the past voices up now, because in hindsight, their foresight makes sense, but at the time these voices were silenced. “They” say that hindsight is 20/20. The first question is simply, “who are ‘they?” There seems to be a “they” with an opinion on everything! However, its still better than driving down the road well looking out a 100% clear rear windshield, and that’s where we stand today as we celebrate reformation Sunday. We want to lift up the past voices that have shaped us, that freed us, and allow them to guide us, but not allow our vision to get restricted to the past… these “reformers” taught us to look forward and embrace change. Like “reformation,” Protestantism, as both a movement and a vocabulary word, bears history. The name actually arose in 1529, several years after Charles V had declared Martin Luther a Heretic, when leaders of several German cities and churches put aside smaller differences in their theology, and united to ‘Protest’ as one body. 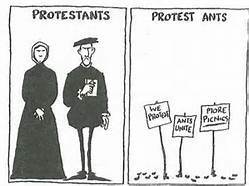 They thus became known as Protestants, simply put, those who protested. Nearly five centuries later, the Protestant church defines itself as an Ecclesia reformata semper reformanda “A church reformed and always reforming,” but does the church really welcome voices of change? We lifted up Martin Luther as the main voice of this, “Reformation Sunday,” having declared justification by faith, having brought public the corruption of the Church, having empowered each believer to seek God by their own means, and having translated the Bible into common vernacular so that we would all be able to do just that. However, Luther found himself in forced hiding to protect his life, and lucky to have a life to protect! Just about 100 years earlier a man named John Has, a Czech priest nicknamed the “Morningstar of the Revolution,” did not find safety in hiding, but was beheaded as a heretic for speaking a similar message of spiritual freedom. On that note, who was paying attention last week when we looked at that word, “Heresy?” Anyone remember what it meant? “Choice!” A heretic is one who recognizes their ability to choose. Jesus had followers, his disciples, and we hear little about their later years carrying his message of change. Any guesses on their fate? Andrew, Bartholomew, Peter, and Simon found themselves on a similar cross as their leader; one of the two James’ was beheaded and the other beaten with clubs, as was Thaddeus (Jude,) Matthew was burned, and Thomas was made a martyr by stabbing. “Geez Ryan, not your most uplifting sermon,” you may be thinking to yourself right now…” and I apologize for being the downer, but it is our history. Is it not empowering though, knowing how devoted these voices were to the freedom that Jesus declared, that Martin Luther restored, and that MLK dreamt? As a church, we haven’t been around long enough to fall victim to the phrase, “well that’s just how we have always done things,” but instead, we can look ahead with wisdom of our predecessors, as we seek out the truth of Christ to steer us in all that we do. * I haven’t got a clue why we do it this way and I’d rather not spend time thinking about it. * You’re new aren’t you? You new people just want to change our perfect little world, but we are bigger than you. * Have you no blind respect and subservience to those who were here before you? It was good enough for them and it will be good enough for you. * You clearly don’t know how we do things around here; this has nothing to do with logic, fairness and openness. * We don’t like questions like that; they make our meetings unpleasant and last far too long. * Despite what you were told, this is not a democracy and the world is not fair. Sorry. Dear Martin, we like basing people’s salvation on their tithe, we’ve always done it that way. Dear Dr. King, we like the black people to stay out of college and serve the white students instead, we’ve always done it that way. Hey Jesus, we save picking grain for the workweek, you and your followers will have to starve today on the Sabbath, we’ve always done it that way. Luther, during his reforming the church, emphasized what he deemed the “Priesthood of all believers.” An acknowledgement that God has gifted each individual in this room today with the ability to discern, to seek, and to follow… Who are the voices of reformation in your life today, and what changes do you feel need to occur to bring us closer to the freedom of which Christ spoke?